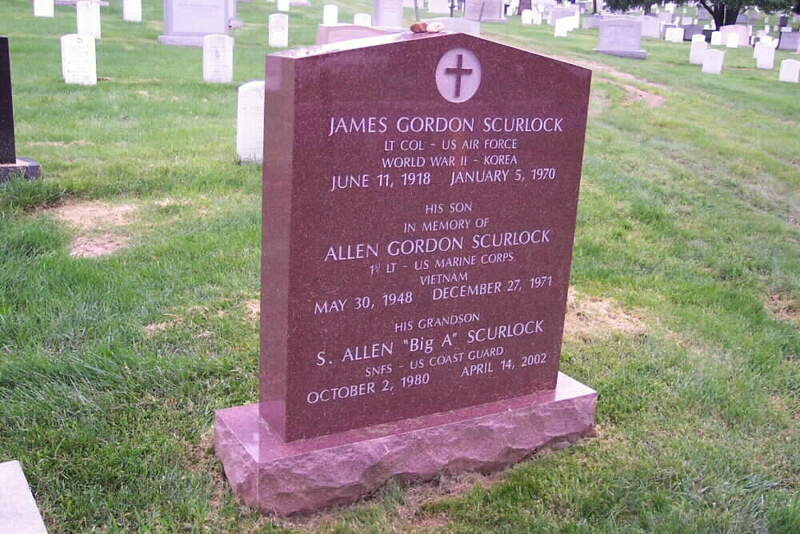 Allen Gordon Scurlock was born on May 30, 1948 and joined the Armed Forces while in Reston, Virginia. He served in the United States Marine Corps. In 3 years of service, he attained the rank of First Lieutenant, United States Marine Corps. On December 27, 1971, at the age of 23, Allen Gordon Scurlock perished in the service of our country in South Vietnam, Quang Tri. NOTE: His portion of a family headstone in Section 6 of Arlington National Cemetery identifies him as a First Lieutenant, United States Marine Corps. Should you have information concerning these individuals, kindly contact the Webmaster. Scurlock and two Marines were killed off the coast of Okinawa (not Quang Tri, SVN) when their CH-46 helicopter crashed. They had been operating off of the USS Tripoli and were doing surveillance of a Russian cruiser and destroyer that had appeared. The craft malfunctioned - as had another CH-46 on 20 Dec 71 that crashed - and all operations of the helicopter were suspended. (Per USMC HMM-165 Logs). The names of these 3 Marines were not added to the Vietnam Wall until 1986.....after Congress allowed names to be etched that died outside of the war zone boundaries but who were in "direct support of" the war efforts.